Bob and I have just spent five days in the Land of Plenty – aka the US – more specifically the Fort Lauderdale area. Although we really love our life in Eleuthera, sometimes it is good to get away for a short break….. We combine slaking island fever with shopping and researching for the various projects we have on at the moment. I realized that we have a certain routine we follow when we travel on these short trips. It is interesting to balance the best of what is familiar and suits us with going for new experiences which are potentially disappointing. What I was really asking myself is when does what is familiar become a boring rut ? Can I tell you fabulous this was at Valentino’s ? 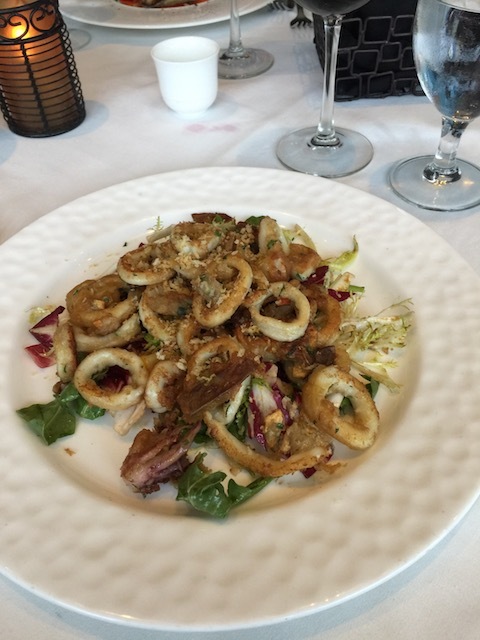 Calamari and artichoke – totally divine ! So we flew with Watermaker’s Air – always a good experience – into Ft Lauderdale Executive Airport. Sound familiar? check. We stayed at the Sonesta Hotel at the end of Sunrise Blvd – sound familiar – check. We rented a big old Tahoe vehicle from Sixt – sound familiar ? check. 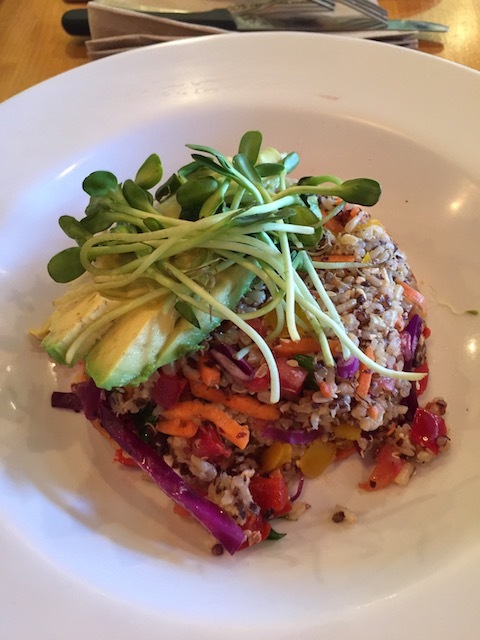 First night meal – One Door East s f ? check. And fabulous as well. All the usual stops – Ikea , Home Depot, Lowe’s blah blah blah…… Dinner one night at Timpano – the mussels – remember ! Dinner at Valentino’s – superb – but sounds familiar – right ? So just when I thought that we were really in a rut, up pops the opportunity for trying something new ! After having bought 55 fans !!! at Dan’s Fan City I asked the manager about anywhere close by where we could get some healthy food for lunch – so he recommended MayaPapaya– nearby on Sunrise Blvd. It was terrific – very very healthy food and fantastic juices freshly squeezed – and very busy as well. It was a great find. Then we went on to the chiropractor Jesse Rogers for Bob to get his back fixed and told him about our new lunch spot ….. He did of course know it and then went on to tell us about another gourmet vegan restaurant called Sublime on US1 – just north of Sunrise Blvd. They were closed on Monday – our last day there so we have looked it up and will be visiting there next time we take a trip….. Just when you think that you have run out of new ideas out pop a couple in a matter of hours ! 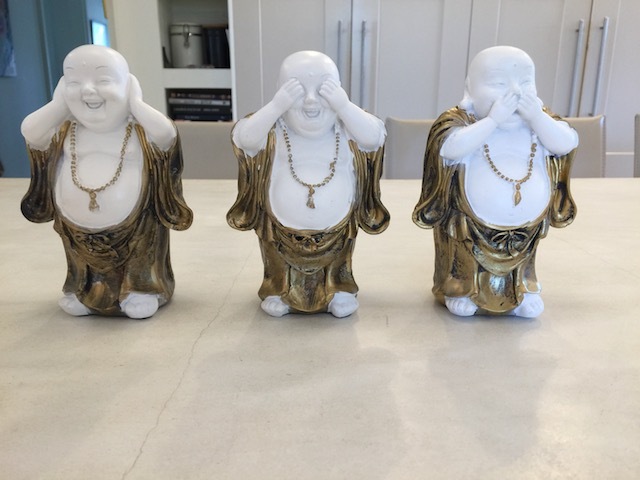 Bob bought these for me while we were away – Hotei Buddhas – hear no evil, see no evil , speak no evil….. Such a lovely gift – thank you again Bob – best present buyer ever ! One of the reasons we like staying at the Sonesta – apart from the really friendly staff – is that you can pay to watch some good movies – well you can pay to watch bad ones as well but we try to avoid that …. Anyway I want to flag up 3 great movies that we really enjoyed. I may be a bit behind the curve with these but bear with me if you have already seen them. The Founder – this is also based on a true story – it is the story of how McDonalds became the billion dollar enterprise it is. Michael Keaton is superb in the role of Ray Kroc. He is magnetic as Kroc – as many of the reviews agree. Finally we watched Hidden Figures – yet again based on the true story of the 3 of the grossly overlooked women who worked at NASA – it is a beautiful movie – I really enjoyed it. As I read ” the visionary trio crossed all gender and race lines to inspire generations to dream big”……. 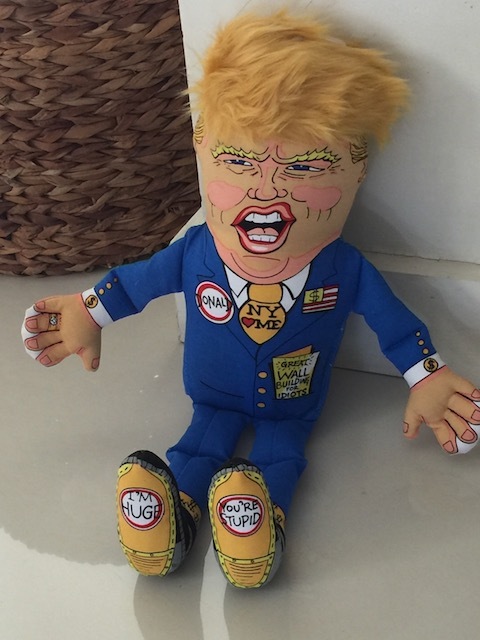 Sorry but I couldn’t resist this toy in the pet store – sitting in the naughty corner before I give him to Rudge !!!! We hope Rudge really sinks his teeth into his new toy! Hillarious. I will post pictures of the ‘after’ !! Lovely to hear from you ….. The saying goes “Genius is simplicity.” Looking at the scrumptious dishes you photographed illustrates how seeing them leads one to emulate their creation for delectation! Now about the contemplative! 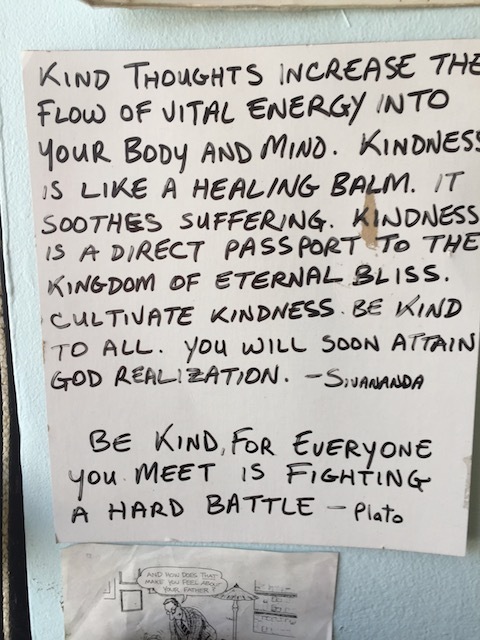 Love the Sivananda and Plato quotes. You always seem to convey inspiration! The three Buddhas? OMG, they remind me of mom who gave me in my childhood three little connected monkeys with the same admonitions that we should all try to live by today. It’s nice to be nice! Cheer from a springing up western Massachusetts. I love the way you pick up on some of the themes I incorporate in the blogs. Thank you ! And pleased to hear that spring is coming to your neck of the woods…….